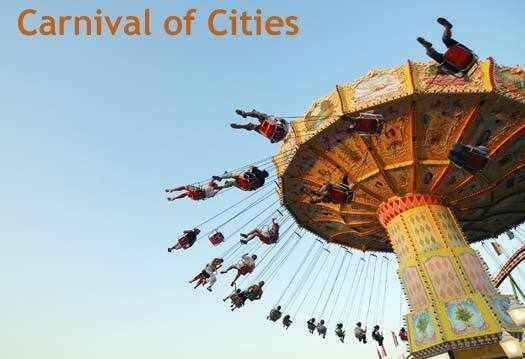 This week we kick off with the new (Nov 5th) edition of the Carnival of Cities. We’ve hosted the carnival before, it’s a great way to share other cool blogs with our readers and spread the love. If you don’t know what a blog carnival is, it’s simply an article, usually hosted at a new site each month, to which anyone can submit a post to be showcased. You can learn more at BlogCarnival.com So without futher ado, here are this editions articles. For a beautiful New York Sunset, check out Hudson River Sunset posted at Shedwa. If you actually believe that anyone famous would go to Seattle…then Mary Jo Manzanares tells us about a cool site that helps you find them in Seattle Notables Spotted Around Town posted at The Seattle Traveler. pSilicon Valley Blogger has a fascinating post about The Minimum Budget: The Cost of Living For A Family of Four (focusing on the Bay Area). I won’t keep you guessing, it’s $77K. And that’s the bare minimum! Um, Silicon Valley Blogger, have you ever considered moving to Buenos Aires? In more news oriented posts, Alfa King Memories talks about how trade unions maintain pressure over ERB and Jami L West probably gets the prize for best title with Broken News-Zombies Attack the Alamo! about a fun little pre-Halloween event, posted at Going to San Antonio. At 10,000 Birds, we hear about a “phenomenal wild space” in the urban heart of Philadelphia, the John Heinz NWR. An American In Oslo has a great travel post about the Trakai Island Castle posted and Wendy from Escape From New York takes us all the way to China with City Icons – Bund, Pudong Shanghai China. Sheila walks us through New Mexico history at Bandelier in her earnestly-titled Perceptive Travel Blog, saying, “[It is a] little-known gem in the Jemez mountains of New Mexico.” And if you want to know more about Life in Brisbane, check out this awesome post about kayaking in Brisbane on a Friday night! And last but certainly not least, The Salem Insider has a very practical post about the lodging lowdown in Salem. That’s it for this Carnival of Cities, hope you enjoyed it. As awesome as Argentina is, it’s good to take a gander at the rest of the world once in a while! You can submit your articles to the next edition here and future hosts can be found on the carnival index page. Thanks so much for hosting the carnival! It can be a lot of work and you did a great job! Thanks for the love back guys! It’s fun to learn about new blogs through the carnivals. Thank you for including me. I hope to return to beautiful Buenos Aires one day soon. It is a spectacular city. This page rendered in 0.06 seconds.